The reason for the surgery is that it turns out I have Graves' Disease. I was diagnosed with this in August after my symptoms got to the point that I looked for specialist help, with encouragement from my family. Graves' Disease (GD) is an autoimmune disorder of the thyroid which causes the over-production of thyroid hormones. 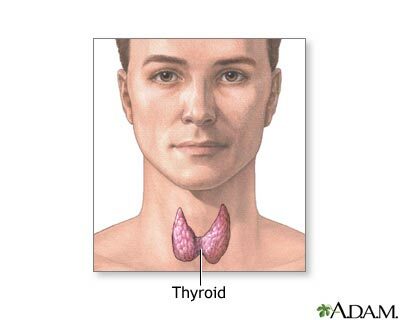 With Graves' Disease the thyroid is attacked by the immune system as though it were a foreign body. Specifically, antibodies attach to thyroid stimulating hormone receptors within thyroid cells causing the thyroid to go 'hyper' - (so I have Hyperthyroidism). This is bad because the thyroid releases the hormones than govern growth and the body's metabolism. 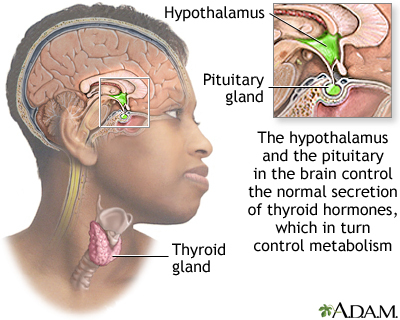 Usually, the hypothalamus regulates the pituitary gland (both located in the brain) and the the pituitary gland regulates the thyroid's production rate of hormones thyroxine (T4) and triiodothyronine (T3). Graves' Disease causes the brain's instructions to be overridden and causes the thyroid gland to over-produces these T3 and T4 (massively in my case - by 700%). My symptoms were ever so slight at first and got progressively worse over a period of about a year without diagnosis. These symptoms included heat intolerance (inconvenient), weight loss (convenient), constant trembling in the hands, arms and legs (inconvenient and concerning), restlessness (inconvenient), increased energy (convenient), fatigue (inconvenient), difficulty sleeping (inconvenient and convenient), 'bounding pulse' (scary), itching overall (annoying), and anxiety (unpleasant). During this time I wasn't able to get sleep until around 1 or 2am and got up around 4 to 5am. It did wonders for my blogging and night-time work productivity, but I felt constantly agitated and 'up' almost as if I was on some never-ending natural narcotics ride. I felt like I was permanently tripping. It was tiring though, being on an ever-lasting high. I remember during the last summer friends and co-workers were asking me about the trembling in my hands. It was horrid having no explanation for them as I hadn't been diagnosed yet. At one point I abstained from coffee for two weeks thinking (hoping) the trembling would stop and identify the cause. But of course this had no effect. My weight loss was accelerating yet I was eating more. I was never still. My mind was always working. I tried a few things to calm the mind (including my friend's Meditainment CDs which helped me get to sleep). When I saw the regular doctors they put it all these symptoms down to stress. This didn't sound right to me or my wife. I've dealt with stress fine in the past and I'm not the anxious type. I did feel 'off the scale' though, for months. I was getting worried about my health at this stage, my wife even more so. Fortunately (or unfortunately, depending on how you look at it), my father has Graves' Disease (GD has a strong genetic component). He happened to be over in Seattle during late summer last year and recognized the symptoms right away. We immediately sought an appointment with an endocrinologist who confirmed the diagnosis after a comprehensive blood test. I got lucky. Once the diagnosis was made, I went on a course of drugs (and still am), including methimazole (reduces the T3 and T4 levels), metropolol (beta-blockers), dexamethanoze (a corticosteroid) and anthihistamines, each playing their part to slow down the thyroid's production of the T3 and T4 hormones, normalizing heart rate and bringing the various kpi levels back down to close to normal and eliminating the symptoms. The challenge for the doctors has been to bring levels back to normal in incremental steps and not bring me down too suddenly. Going to far too soon with these drugs have the risk of taking you other way - hypo - hypothyroidism. The following table summarizes test results and their potential meaning. Within around 2 weeks I felt normal again. Inner peace returned. I had forgotten what it was like. The weird thing is, I didn't realize my inner calmness was gone until it came back. I've always had an active mind and always seem to be thinking about something, but the manic of the mind during the untreated period was really something else. Normally, I can find quiet when I want to. Thankfully this ability and regular neural activity returned. The sleep deprevation ceased as did the trembling, perceived over-heating, itching and everything else that was wrong. So far, I've been lucky in having a very good doctor and my body responding well to the prescribed drugs. Once stabilized (I've been stable at near normal levels now for about 6 months) we then go for the long term treatment. Now, you can't actually cure Graves' Disease (although about 30% of those with GD do return to normal on their own...'normal' being not having a hyperthyroid). Given my extreme levels before the initial course of drugs the specialists believe GD will remain with me for the rest of my life. What we can do (and this is the point of the surgery) is to essentially delete the thyroid out of the hormonal equation (by destroying or removing it) and to then to supplement the body with the hormone replacement that makes up for the deleted thyroid (that will no longer be there to produce the T3 and T4). The idea is that because the thyroid is not functioning and therefore out of the equation, it is much easier to maintain normal relevant hormone levels though a set level of hormone replacement (pills). The only downside is that I'll need to take pills for the rest of my life. No side effects are currently reported. Seems like a good deal to me. There are two options when it comes to deleting the thyroid from the equation - radioactive iodine (Radioiodine) or surgery. The radioiodine is actually radioactive, as in nuclear. It acts like a smart nuclear bomb. It is taken as a single pill and seeks and destroys most of thyroid tissue, leaving most other tissue-types relatively unharmed. Once done, the thyroid is meant to reduce its levels of T3 and T4 production. One (of the many) risks of this treatment is that the radioiodine may not kill of enough of the thyroid tissue for the treatment to be effective therefore requiring either further radioiodine or even surgery. The downside of this treatment and this risk in particular is that if surgery is later required it becomes a significantly more complex an operation (because of the tissue damage the radioiodine has previously caused), there by increasing risks associated with the surgical procedure (these include damaged vocal chords). My doctors have said that it up to me which treatment I should take. In their view there is no clear 'better way' in my specific case because my levels are so high. If my levels were lower (i.e. less hyper) then they would recommend radioiodine over surgery. I've decided to go down the surgical route. My rationale being that I might as well go with the 'cleaner' solution straight away and therefore remove the risk entirely of the surgeon having to deal with damaged tissue caused by a failed radioiodine treatment. I don't think there is a right or wrong in this case, but as the doctors say, it is down to a personal preference. Interesting to note that the radioiodine treatment is much more popular in the US compared to the rest of the world that opts for surgery as the preferred long-term treatment of Grave's Disease. I don't know why this is the case. Anyway, the surgery itself won't happen for another 8 weeks. It's nothing really major, but I've not had an operation of this scale before so I am naturally a little apprehensive. I'm going to watch a video of the surgery here (probably not for the squeamish) and see what it's all about. I guess writing this post has been some kind of mental preparation for me. Thanks for reading. Your blog has been very informative — I’ve learned SO much about RSS, Attention etc from you. You’re a "real person" sharing their personal technical passions. And through this I’ve gotten to "know you" – my positive thoughts and prayers are with you my blogging friend! Good luck! There must be more options, people have accomplished miracles through diet and exorcise. I’m sure everything will work out for the best Alex. I felt like you were talking yourself into an operation throughout that post and it turned out I was right. I would go for the surgery too. I’ve been under 3 times (once for my boss’ bad driving landing me in a coma for 10 days, once for an upper GI and once for a lower GI) and I never got past 2-3 numbers (after being put under) before waking up in recovery, just groggy and ready to sleep for awhile. Other than that, its all history. Of course, we understand your apprehension, especially when married, but you’re one of the good folks so everything will be just fine. G/L and please keep us posted. Alex I wish you all the best! Having been through a major surgery this year, I can appreciate the anxiety you must feel over this. In my case, blogging about the procedure certainly helped come to terms with it, so keep the posts coming! FWIW, it sounds like you’ve made the right choice, despite needing to take medication for the rest of your life. I enjoy your blog and appreciate your openness about this. Good luck with your surgery and best wishes. Sometimes, it is not the exact words, so let me say: Ich wünsche Dir alles Gute und Liebe, mein Freund, ich weiss dass wir alle Angst hätten und Du hast den Mut das zu schreiben. Mach es gut! I think you know what I wanted to say without translating. I’m so sorry to hear about this but your attitude seems amazing considering everything. Kate and I send you our best wishes and hope that everything turns out well. Hey Alex, I’m glad you took the time to post about this, it’s a very brave thing you’ve done but I think you’ll find it’s very cathartic to bring it out in the open. Sorry, hehe, just trying to add a bit of levity. Be brave and trust that God will be watching over you. While surgery is always a scary prospect, there is no better feeling than finding out something that had been making you feel not like yourself has a medical solution. I’m sure this will all prove worth it for you in the long run, and I wish you the best of luck. My mum had the radioactive treatment in the mid 70’s, and it made the world of difference. Hope it does for you, too. Best wishes. take care and best wishes, Alex. Hope things turn out well. There must be some other alternatives to surgery/radioactive. Wow……. I’m sure everything will work out. Good thing you found it early. People that are orphans have a terrible problem with this since they have not genetic relatives to warn them about these issues. I guess in the future we’ll all be screened and warned about potential problems later in life. Sorry to hear about your condition Alex. I hope the surgery clears it up and you get back to ‘normal’ life as soon as possible. Best wishes and I hope everything goes well. If you need some steadying, give Mike Magee a shout. He had major heart surgery just a few years ago. On the NHS of all things. Good luck! I’m sure it will all be great. Hi Alex . Good luck with your surgery. I’ve noticed people have asked if there are other options. Well after being on carbimazole(methimazole) -for Graves Disease-for 6 months I started taking a herbal mixture as well (bugleweed, motherwort, melissa, rehmania). I then stopped the carbimazole 6 months later (for over a year now)and am gradually reducing herbal mix (now 2x weekly). All my blood tests are in the normal range. Hope this might help someone to know that alternative therapy can work for some. I am scheduled to have a total thyroidectomy on July 18th due to a multinodular goiter. I am nervous also because my Dr. said that on a scale of 1-10 for surgery difficulty mine was a 6. He said my risks were higher due to the size of my thyroid. He also said that in 25 years he has never had to perform a tracheotomy on anyone and that he has performed surgery on others with much larger thyroids. I am concerned about the effects after the surgery. I am already overweight and don’t want to gain any more. My Endo assured me that they will make sure that won’t happen. Has anyone had the surgery and if so how were you after surgery? Was it painful, really hard to swallow? I just want to know what to expect so that I don’t freak out when these things happen. Thanks for sharing Annie. Good luck, and let me know how it goes! Just a quick update to let you know that my surgery went very well on Tuesday and am recovering nicely…. It’s so nice to read what others are going through with Graves Disease….I was just diagnosed in May and I wish I knew more people who knew what it is like…lots of people just don’t seem to understand….I wish you all the best with your thyroid. Thanks Saar – good luck to you. I’m looking into possibly rescheduling my appt. for the RI and looking into surgery. On that note, I wanted to ask you, Alex, if you’re still reading the blog, how are you feeling? Do you think you made the right choice?? I’m so hoping that you’re well and symptom free . . . I would love to hear from anyone who may be in my shoes or has been here. I’m very confused and frightened; not sure of which way to turn. I understand the delay; however, the faster it’s displayed, the better . . . my clock is ticking . . .
Brooke – my surgery went very well. Do I think I made the right choice? Well, given my situation, with the information I had and the advice I was given, yes, I believe I did. But I stress: it was right for me. What I was looking for in particular was a conclusive treatment, or as close to it as possible. The good thing about the surgical route was that it rid me of a variable – the thyroid. Knowing it has now gone, and that a tablet a day is all I need from now on is the kind of solution I was looking for. Physically, I’m totally fine now. A thin scar line is all I have to show for it. I really feel the GD episode is beihnd me and can move on. Hope this helps. Good luck which ever direction you take.